Domino and Florida styles bring flexibility to a new Riva 88. Ferretti Group has created two boats out of one with no less than magic. You may have seen our Riva 88 Florida First Look Video, but this 88-footer can now also be found with a flybridge in the "Domino" version. Both ride on the same hull, which is a clever way to leverage the boat building process, but the Domino version encloses the bridge deck and adds a flybridge. 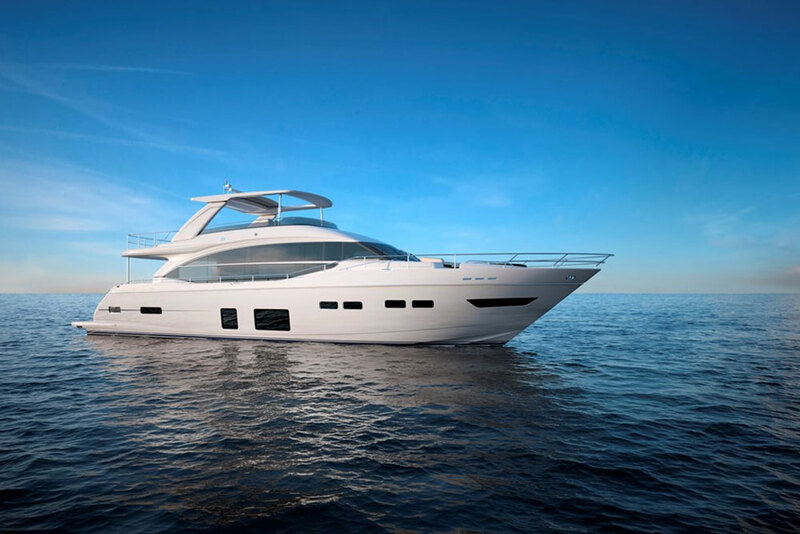 The new Riva 88 Domino adds a flybridge into the mix. The 88 has sporty lines and a slippery hull, and the streamlined design and soft grey coloring add to the elegant but aggressive profile. 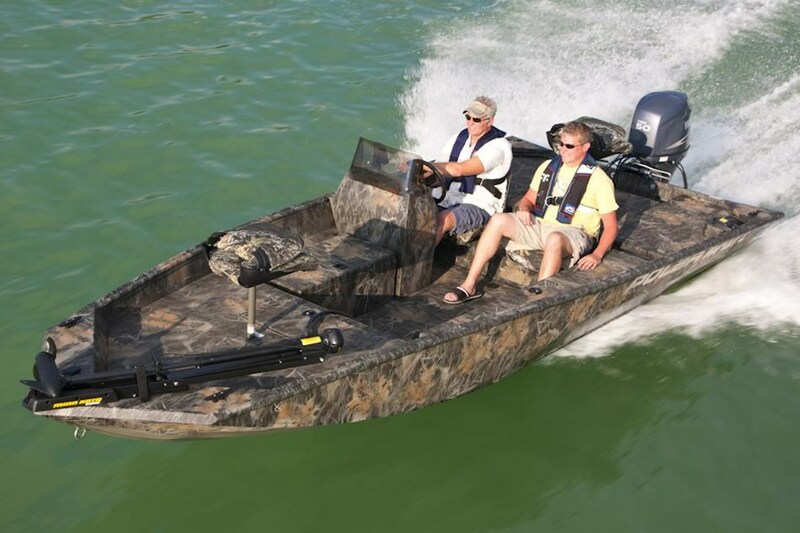 It’s a serious James Bond-style boat. 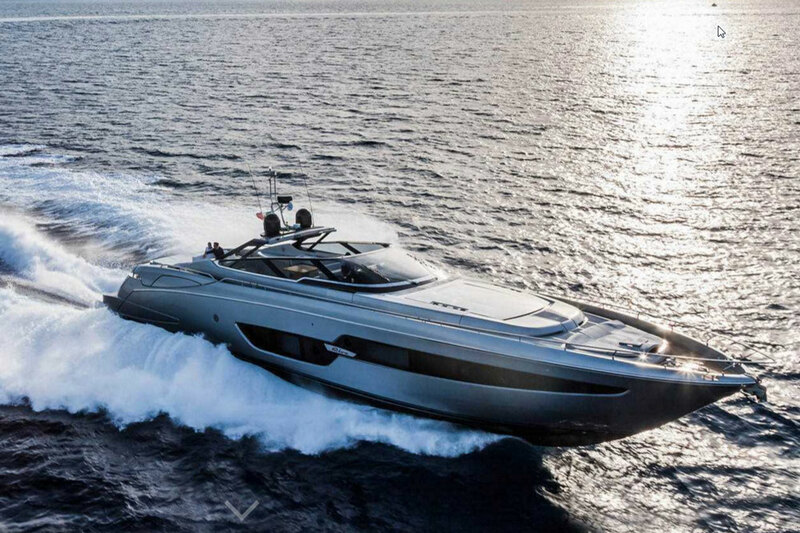 And there’s quite a bit of power in this speedy yacht. 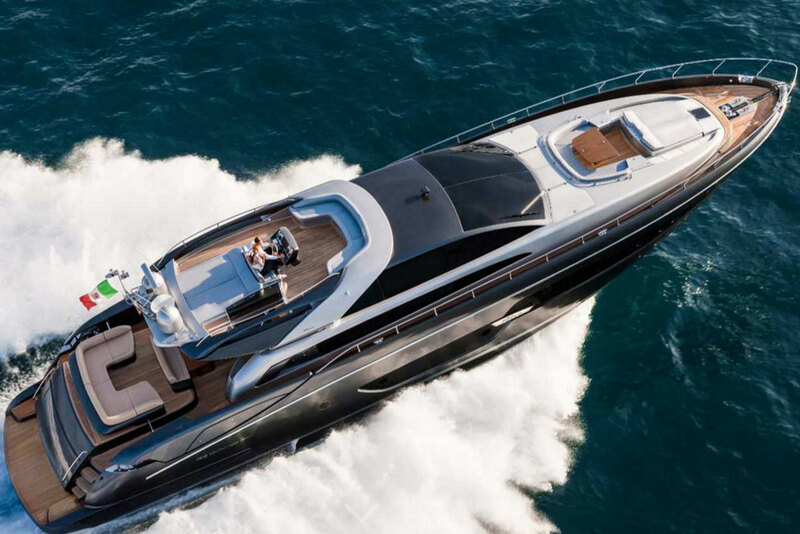 The Riva 88 is powered by twin 2,435 hp MTU 16V 2000 M93 diesels, expected to push the boat at 38 knots at wide open throttle. Cruise is at 34 knots for a 330 nautical mile range. An upgrade to 2,638 hp MTU M94 engines will push the top end to 40 knots and the cruising speed to 35 knots. Deck configuration is dependent on the model you choose. The Florida edition has a patented convertible top designed in concert by Ferretti and Mauro Micheli. 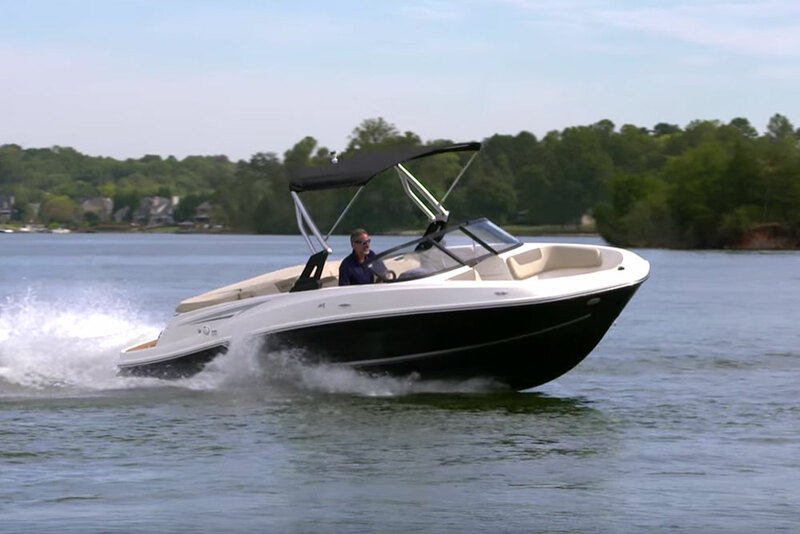 It morphs the coupe into an open express, and back again, with the touch of a button: Hydraulic lifting arms move the hardtop from above the helm in the cockpit out over the foredeck where it rests above a U-shaped lounge, providing shade. When lowered completely, it seals the lounge to protect the space from wind and spray. The retractable arms which make this possible pivot forward and aft, and disappear into the side decks when not in use. To some extent, it’s like watching a convertible car stow its roof. Reportedly, the convertible top may be moved even as the yacht runs at full speed. Sunshine and open spaces rule on the 88 Florida. As seen here, the convertible top is in the down position, covering the amidships lounge. 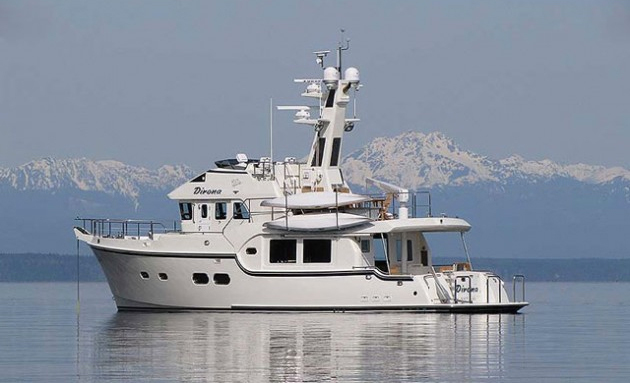 Sun worshipers will relish the large fore and aft sunpads, while the chef will exalt in an outdoor galley that can feed a crowd without ever heating up the interior of the boat–an important benefit in the tropics. The swim platform provides access to a dinghy garage that will accommodate a 13-foot tender with room left over for a PWC alongside. This teak beach lowers three feet into the water to make dinghy launching easier, and provides a space to soak or play in shallow water. Four steps lead up from here to the cockpit and the main social space aboard. 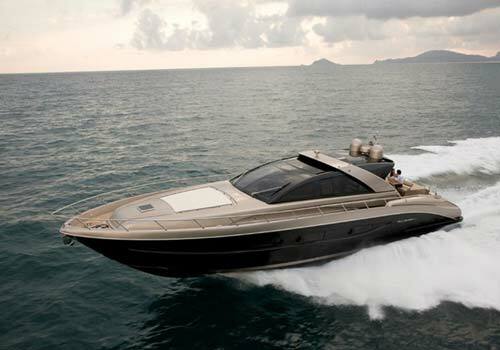 The Riva Florida and Domino Super models vary dramatically inside. The Florida version has an open main deck with a dinette to port behind the single helm. It’s on the centerline with the companionway just off to starboard. There’s a full saloon with an L-shaped settee and table below. The portside open galley on the same level creates an open feel. A flat-screen TV faces the saloon settee. Four cabins complete the interior. The master suite is amidships and aft of the saloon with a king-sized bed in the full-beam stateroom, which also has a master bath and walk-in closet. Fixed windows and a round opening portlight make the cabin bright and well ventilated. The VIP stateroom is in the bow with a queen-sized island berth on the centerline and a head with a separate shower compartment. Two additional cabins, both with en suite heads, complete the accommodations. The finish is a soft-touch elm wood with lots of stainless-steel and stitched leather accents. The style is contemporary, but soft. On the other hand, the Domino Super makes different use of its social spaces. Because it’s enclosed on the main deck, the saloon is one level higher (replacing the open cockpit) with a glass door entry that opens into a large communal space. 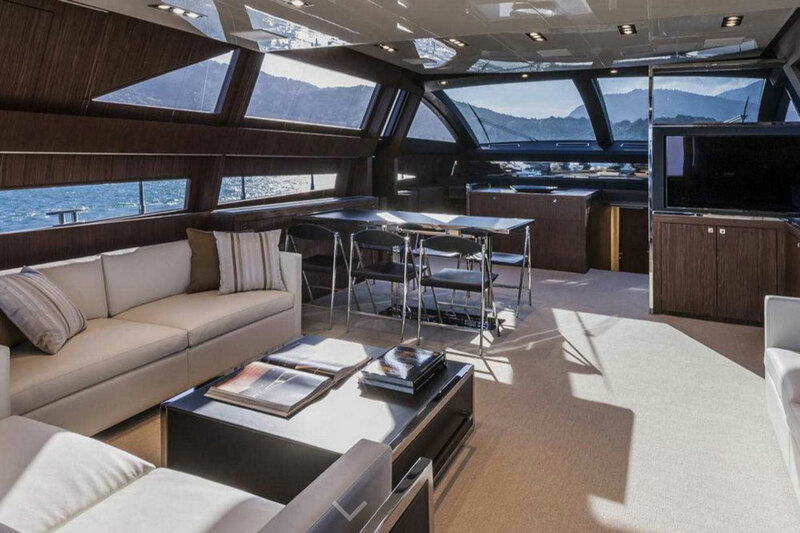 Two levels of windows provide good sightlines for guests both seated and standing while two L-shaped settees to port and one straight settee to starboard invite guests to lounge in comfort. 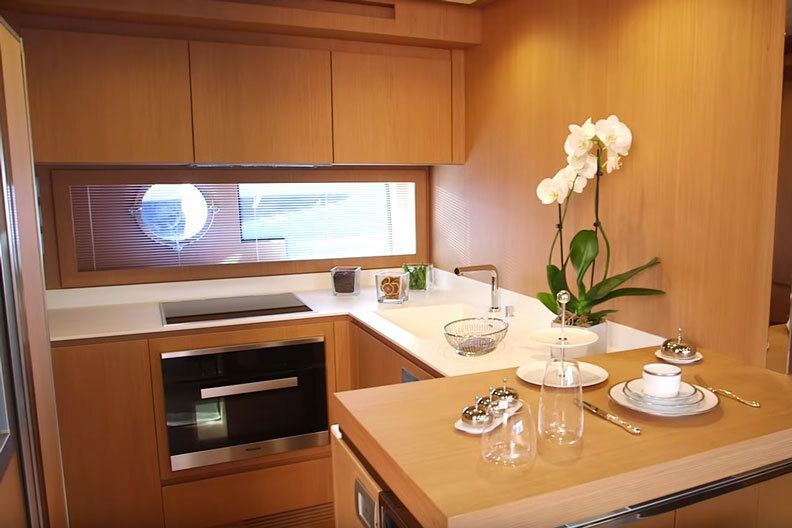 A six-chair dining table is to port, across from a flatscreen TV that faces aft, and access to the cabins below is on the centerline, where a few steps lead down to the galley. Four cabins with four heads follow the same pattern as on the Florida model. 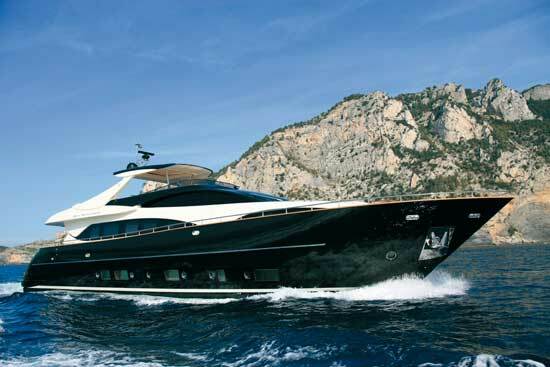 The biggest differences between the Riva 88 models are belowdecks. Here, you see the saloon under the flybridge on the Domino model. Both versions offer crew accommodations, accessible via a pod outside to port on the upper deck. Two single cabins, for a captain and mate, share one head and a small dinette. From here, engine room access is direct. These two distinct deck configurations ensure that Riva 88 owners can customize their onboard experience based on their boating location and style. Riva has leveraged one hull to create two distinct models that will appeal to many boaters in many climates, which is quite clever–clever by design. Other Choices: The Princess 82, the Azimut 84, or the Ferretti Alura will likely interest buyers who are looking at the Riva 88. For more information, visit Riva.